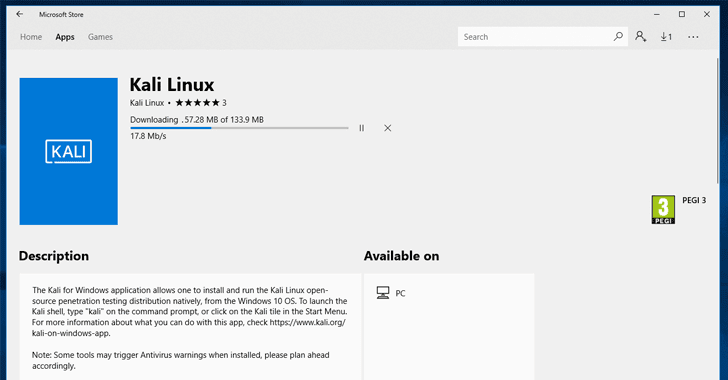 Now you can download and install Kali Linux directly from the Microsoft App Store on Windows 10 just like any other application. Kali Linux, a very popular, free, and open-source Linux-based operating system widely used for hacking and penetration testing, is now natively available on Windows 10, without requiring dual boot or virtualization. Kali Linux is the latest Linux distribution to be made available on the Windows App Store for one-click installation, joining the list of other popular distribution such as Ubuntu, OpenSUSE and SUSE Enterprise Linux. In Windows 10, Microsoft has provided a feature called "Windows Subsystem for Linux" (WSL) that allows users to run Linux applications directly on Windows. "For the past few weeks, we've been working with the Microsoft WSL team to get Kali Linux introduced into the Microsoft App Store as an official WSL distribution, and today we're happy to announce the availability of the 'Kali Linux' Windows application," Kali Linux said while announcing the news. If this is your first time using Windows Subsystem for Linux (WSL), you need to enable this optional Windows feature before getting the Kali Linux app. 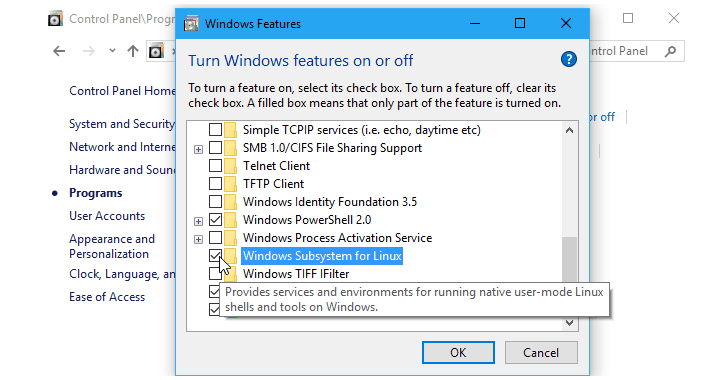 Navigate to Control Panel and go to "Apps and features"
You can even do the same by opening PowerShell as Administrator and running the following command and restart your computer. Now search for Kali Linux on Windows Store, download it with just a single click. Once you launch the application, it automatically completes Kali installation and will open the console window. That's it! You can also check Kali Linux documentation for more information. If you are interested in enabling Kali's desktop environment, here's a video demonstration showing how you can install xfce4 and xrdp to connect Kali Linux over Remote Desktop. This announcement is especially exciting for security professionals and penetration testers who have limited toolsets due to enterprise compliance standards. Kali Linux on Windows does not come with any hacking or penetration testing tools pre-installed, but you can easily install them later. It should be noted that your Antivirus application or Windows defender can trigger false-positive warning for hacking tools and exploits, but you need not worry about it. Microsoft is following its commitment to the open source community. In 2013, the company launched Visual Studio, and a year later, it open-sourced .NET. In 2015, Microsoft open-sourced the Visual Studio Code Editor, as well. In 2016, Microsoft brought Ubuntu on Windows 10, worked with FreeBSD to develop a Virtual Machine image for its Azure cloud, chose Ubuntu as the OS for its Cloud-based Big Data services, and even joined the Linux Foundation as a Platinum member—the highest level of membership.